This report might not bring an end to public or academic discussions on the nature, force and purpose of the sharing economy, but it can make them more constructive by formulating a clear, operationalizable definition of what the sharing economy is. Moreover, it provides a unique insight into what actually drives the development of peer-to-peer services, while teasing out some of the most important drivers of capitalism itself. Perhaps most important is however to provide a resource for the research community at large to help enhance our understanding of the sharing economy. The global index — the very first of its kind — tests a number of hypotheses on the correlation between the development of the sharing economy and the regulatory context. Are these services hampered or propelled by high levels of government intervention in the economy? Can the sharing economy help alleviate a lack of general social trust, which is a significant obstacle to all economic activity? Or do activities of this kind require a public that generally thinks well of strangers in order to gain ground in the first place? For Timbro, founded in 1978 and the largest free market think tank in the Nordic countries today, these are vital questions to explore. Political responses have varied, but in many countries there have been moves to ban, prohibit or inhibit the growth of the sharing economy. Companies like Uber and Airbnb have become symbols for a gig economy that labor unions abhor, while providing tough competition to incumbent interests whose business models are based on complying with regulations that do not – and often should not – apply to newcomers. At the end of the day, the sharing economy places politically existential issues on the table. Are there other ways of providing consumer protection than by lawmaking? What happens when the distinction between employee and service provider is increasingly muddled? Will capitalism itself change if digitized business models push down transaction costs to levels that eventually challenge the notion of the firm itself? An outstanding team of researchers has produced this report. Head researcher Alexander Funcke is a postdoctoral fellow in the Philosophy, Politics and Economics program at the University of Pennsylvania. His research examines the underpinnings and dynamics of social coordination, and social norms in particular. Andreas Bergh is Associate Professor in Economics at Lund University and at the Research Institute of Industrial Economics in Stockholm. His research focuses on the welfare state, institutions, development, globalization, trust and social norms. Joakim Wernberg is research director of the megatrends program at the Swedish Entrepreneurship Forum. He has a background in engineering physics and holds a Ph.D. in economic geography from Lund University. His primary research interests are complex systems and the interaction between technological and economic development. 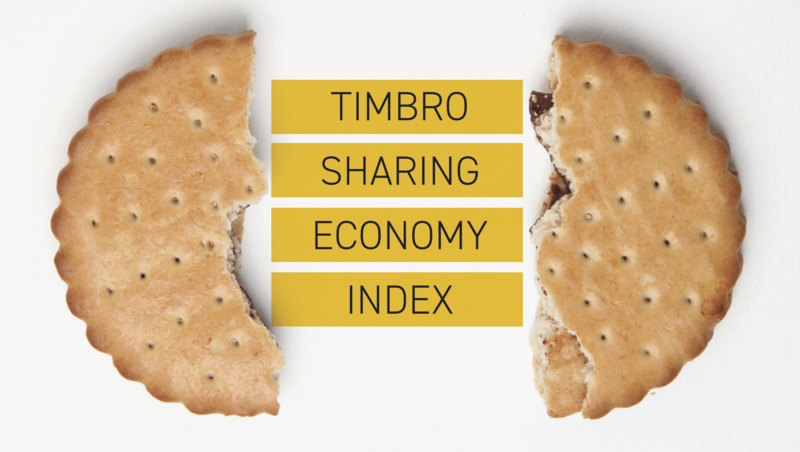 The contributors Kate Dildy and Gylfi Ólafsson have provided the team with invaluable support throughout the process of finalizing the Timbro Sharing Economy Index. We are greatly indebted to them for their efforts and hard work. Andreas Bergh is Associate Professor in Economics at Lund University and at the Research Institute of Industrial Economics in Stockholm. Alexander Funcke is a postdoctoral fellow in the Philosophy, Politics and Economics program at the University of Pennsylvania. Joakim Wernberg is research director of the megatrends project at the Swedish Entrepreneurship Forum. Kate Dildy is an undergraduate student at the University of Pennsylvania. Gylfi Ólafsson holds a master’s degree in economics from Stockholm University. Monthly traffic data was collected for 286 services in 213 countries. For 23 of the 286 services, a complete count of active suppliers was done using automated “web scraping” techniques. Previous cross-country reports have employed surveys or self-reported indicators and have thus relied on conflicting colloquial definitions of the sharing economy. To overcome this problem, we have developed a definition of the sharing economy that allows for exact classification of the services. This allows us to use traffic data and scraped usage-data without fuzziness about whether it is about a sharing economy service, or not. Using the definition, we have considered 4,651 service candidates worldwide, 286 of which were classified as sharing economy services. Note that the fact that but 10% of the candidates qualify as sharing economy services with our definition says more about how broadly we considered candidate organizations rather than it being exceedingly narrow.